Written for TheDesignAir by Adam Ralston | San Francisco is inarguably one of the busiest US gateways to and from Asia. All US legacy carriers and a multitude of foreign carriers provide direct service to several points of entry throughout Asia. That said, it’s still exciting when a new entrant steps forward to toss their hat into the trans-Pacific ring. 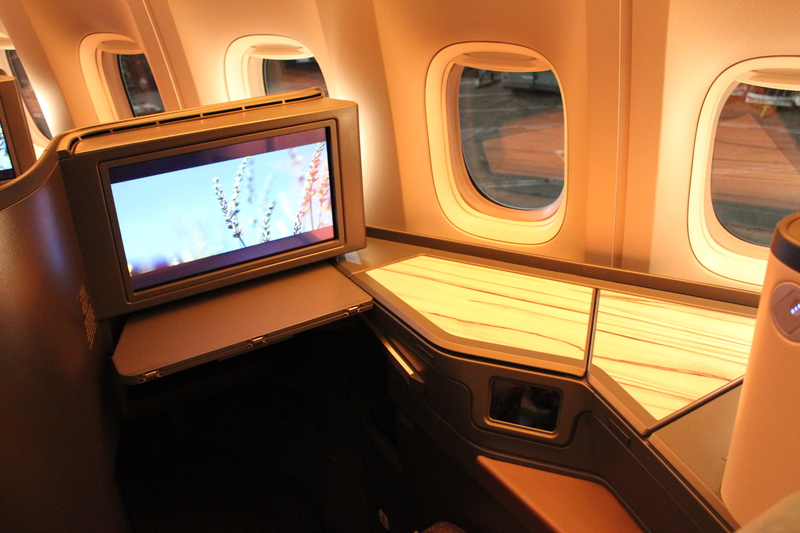 Especially when they’ve revamped their business, premium economy, and economy products and are eager to show it off. Enter China Airlines. With a fresh fleet of 777-300ERs – the youngest delivered as recently as 25 August 2015 – the Taiwan-based carrier is giving hometown rival EVA Air a run for its money with a fresh take on the trans-Pacific service to Taipei’s Taoyuan Airport. 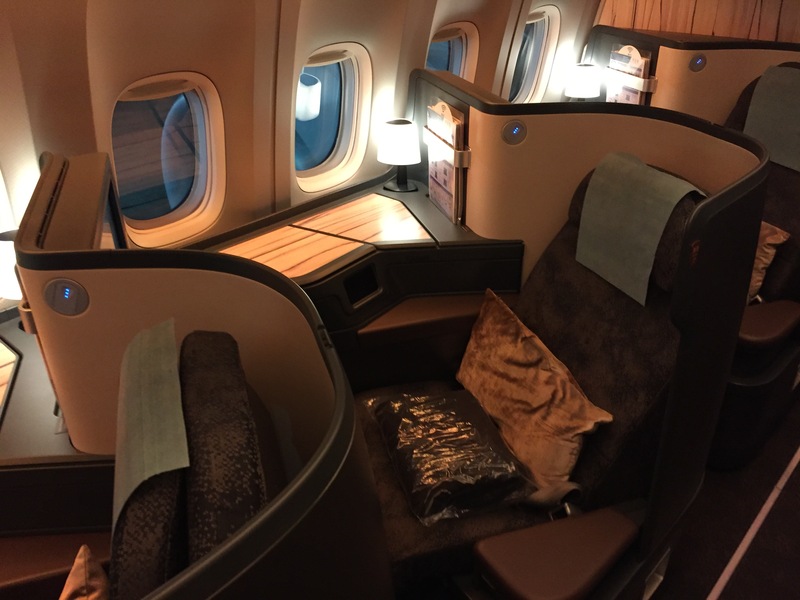 We’ve written (and admittedly gushed) about China Airlines before when we were their guests on their new planes last year, albeit on an intra-Asia flight. This new service, though, is ripe for review for those seeking a relatively affordable premium business experience to and from Central Asia from America’s west coast. Though this was a return trip with two separate flights, the flights themselves were nearly identical in service, timing, and hard and soft product. 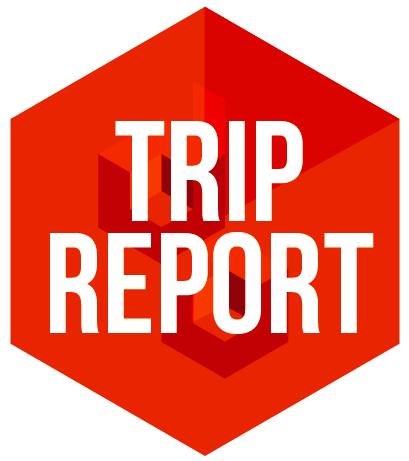 We’ve thus combined most aspects of both flights into this one trip report, only differentiating when necessary. Check-in at San Francisco via the Premium Business Class line was quick as we arrived slightly under three hours early. We were called to the counter promptly by the China Airlines check-in associate, provided with boarding passes and lounge invitations, and directed to the priority security line. Surprisingly, China Airlines maintain their own lounge at the outstation San Francisco despite having only one daily flight to or from SFO. Housed in a small wing off the international A Terminal just past security, it could certainly use some updating – common amongst most of the foreign carrier lounges at SFO. The food spread consists of what you’d expect from a well-stocked US domestic carriers’ lounge: some finger sandwiches, assorted fruit, sushi samplers, congee, snacks in the form of chips/crisps, and cookies or peanuts. Soft drinks, waters, and beer were well stocked in several refrigerated units and one each red and white wine was available for self-pour. There was also a full bar – though it wasn’t manned actively whilst we were there, but I was told the lounge attendants would be happy to mix anything we’d like. Since, CI3 departs at 01:40, making a meal of lounge fare is likely not the priority for many of the lounge guests. But with fast internet – a highly sought-after commodity at SFO – and a clean and quiet atmosphere, it’s perfectly suitable to while away an hour or so pre-flight. Check-in in Taipei was equally friendly and efficient, and security a breeze. Again, this was a later flight so neither the airport nor China Airlines’ three lounges were busy. 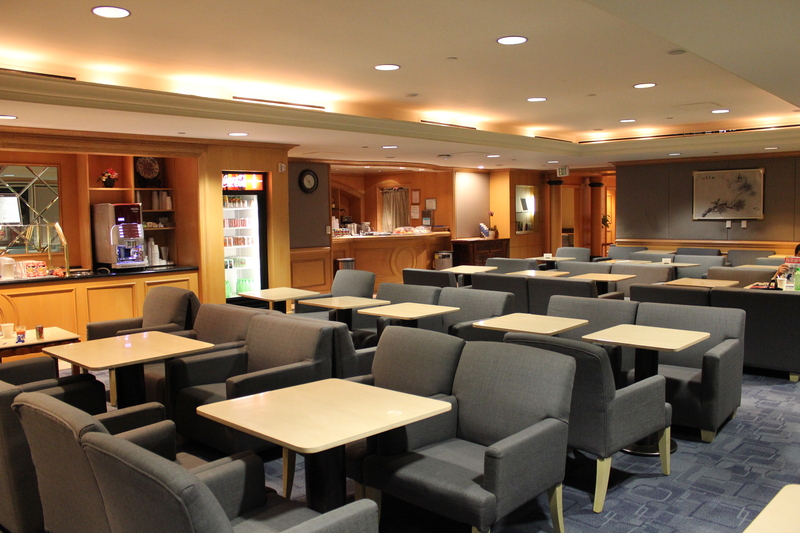 We’ve already reviewed the new lounge in Terminal 1 here when we flew with them in November. All we can say is that the last 9 months have been very kind to the Ray Chen-designed lounge as it seems to have only gotten better with age. Any initial hiccups have vanished and the lounge just simply oozes sophisticated elegance and style. A rotating menu and extensive liquor, wine, and champagne selection ensures repeat passengers won’t get bored with the culinary offerings no matter how frequently they travel. 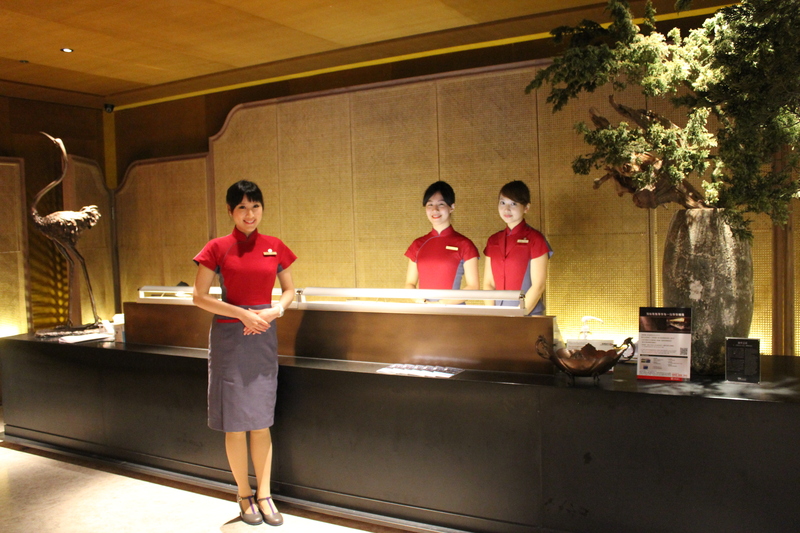 Terminal 2 hosts China Airlines’ other lounge for both Dynasty Fliers and Sky Team elite members. Though plain by the high standards set in the Terminal 1 lounge, it is functional, comfortable, and provides ample food and beverage options. Offering shower and changing facilities and two levels of seating it’s decidedly the more Western-oriented lounge of the two lounges yet to be renovated as part of this China Airlines makeover. Though clearly a cut above San Francisco’s offering and perfectly lovely for a short layover or an hour or so pre-flight, we’d not make it a point to visit this lounge for its own sake. Above immigration, overlooking over the check-in desks at Terminal 2, China Airlines have placed their Supreme Lounge, available only to the top tier Dynasty Fliers. Decorated in a distinct Chinese aesthetic, this lounge provides guests with various private and shared seating cubicles. Lots of glass, light woods, and Asian themes abound while lounge attendants provide table service to passengers awaiting flights. While the menus in all three lounges share key features, this lounge skewed more towards Eastern culinary themes while the other Terminal 2 lounge skewed Western, which makes sense as top tier members would likely be from Taiwan proper with the associated palate. With showers and private bathrooms, this quiet oasis above the hustle and bustle of check in most assuredly hits the mark with China Airlines’ elites. The clear winner of the four lounges visited is the recently renovated Terminal 1 lounge, hands down. Really, though, that’s not fair to the others awaiting their own makeovers. Rumor has it the plans are in the works, but China Airlines staff were hesitant to provide any specific dates, so we’ll have to keep checking in for updates. Still, Terminal 1’s lounge is open to anyone who can access any of the lounges, regardless of their departure gate. So if you don’t mind a bit of a walk, you’ll not be disappointed. 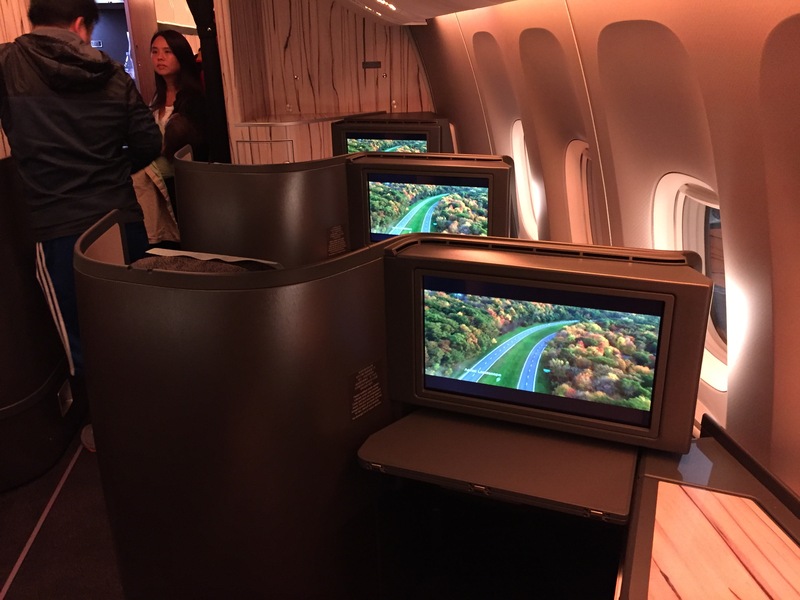 Boarding was an orderly affair with lines separating Premium Business Class, Dynasty Flyers and SkyTeam partners with status from Premium Economy and Economy to keep people flowing. It’s worth noting that the gate agents were actively measuring and weighing hand baggage as passengers passed through the boarding queue – something to be mindful of if you’re prone to bending the rules but that we were happy to see. Walking through door 2L into China Airlines’ much-touted Sky Lounge, we were warmly greeted by the in-flight crew servicing the Premium Business Cabin. 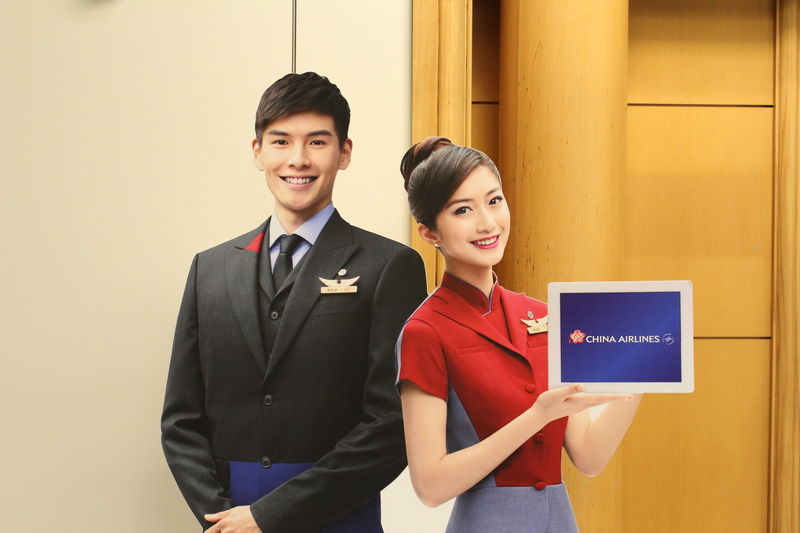 All were sporting the new China Airlines uniforms, and discussions with various ground and in-flight staff show the update has been well-received and the new styling has blended well into operations over the last month. We tend to agree as the new look is quite sharp. We made our way to our assigned seats in row 23, the last row of the second, smaller Premium Business Cabin. 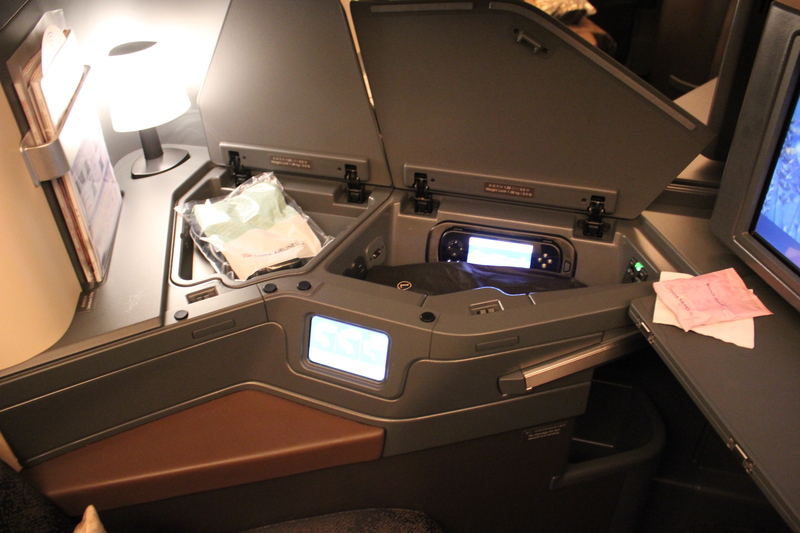 First impressions being critical, this new 777-300ER amazes. The persimmon wood-look finishes on bulkheads and horizontal surfaces and tray tables, accented by the glossy black and matte grey edging and vertical surfaces exudes class and polish reminiscent of an upgraded Westin or Grand Hyatt. Add to that chrome finishes on door pulls and edging. 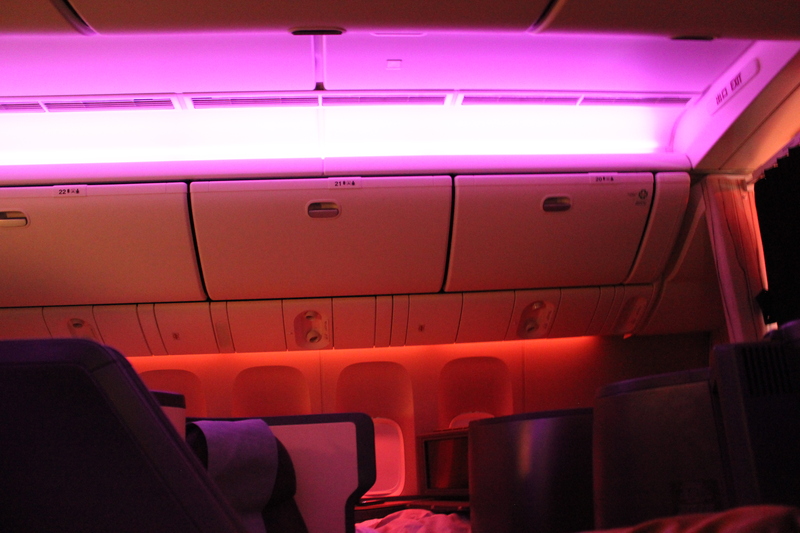 The Ray Chen-designed interior, overall, is stylish and refined and lacks the over-the-top ostentatiousness of some other airlines’ business offerings that can make the interiors seem gaudy with loud colors or an overabundance of useless bells and whistles in the name of “features”. Its grey-black-ash palate exudes quiet sophistication, especially when compared to the myriad, boring shades of dark blue or grey that seem to be prevalent in many business class products. 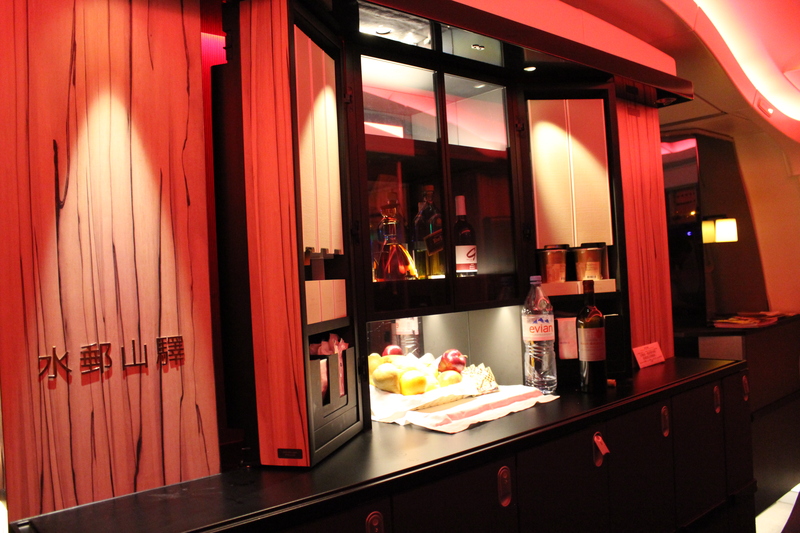 The addition of the faux-wood finishes softens the tone, as well, creating the atmosphere of a nice cocktail lounge. 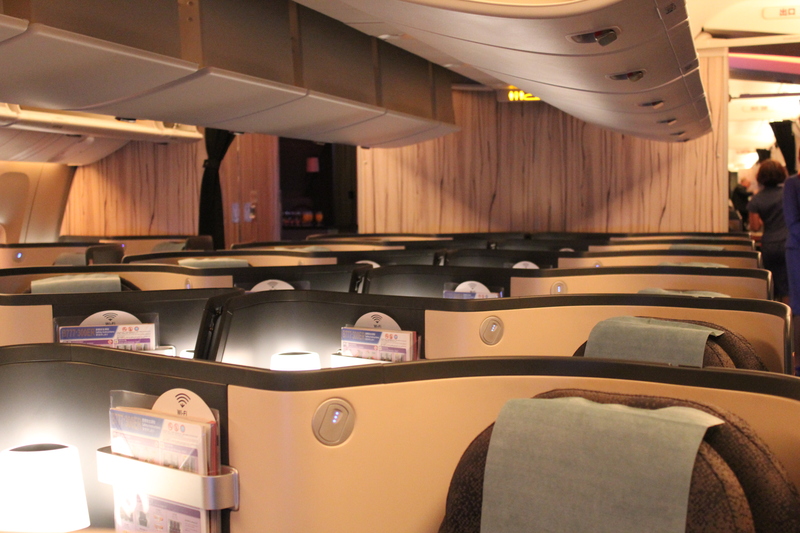 We hope China Airlines pays certain attention to these beautiful, coordinating elements as proper care will keep these cabins fresh and inviting for years to come. The lavatories, an area of increasing focus in today’s premium cabins, continue the understated refinement of the larger cabin. Though China Airlines’ fall on the simpler end of the spectrum – no vessel sinks, fresh cut flowers, or wealth of designer personal care accouterments – the chrome finishes, monochromatic color palate, and the Taiwanese folk ink prints on the forward bulkheads provide a sense of sophistication. An interesting addition we’ve so far only seen on China Airlines is the piped-in Muzak; an eclectic mix of piano concertos and jazz classics, played just loud enough to be noticeable without being intrusive. Further, the flight attendants kept a watchful eye on all the lavatories and refreshed each after nearly every use, wiping down counters, fluffing tissues and paper towels, and folding each toilet paper end into a neat triangle. The BE Aerospace seats, configured in the now-commonplace 1x2x1 reverse herringbone setup, all offer aisle access and reasonable sense of privacy within an otherwise open pod. The only drawback of these otherwise intuitive and comfortable seats is that China Airlines have opted against the privacy divider between the coupled center seats, so those traveling as individuals may want to choose a position near the window. This is an inconvenient drawback that I would hope to be corrected when China Airlines accept delivery of their A350s next year. Seating surfaces are covered in a cool grey-green fabric with interwoven silver elements to further enhance the metallic, earthy, and woodsy tones. All control elements are within easy reach, as are the Seat positioning is fairly upright for take-off and landing, but the presets for lounging and sleeping are clearly marked on the intuitive touchscreen seat controls used to manage the seat and ambient lighting and are usable once you’re off the ground. The shell of the seat continues the design aesthetic of the bulkheads by incorporating textures reminiscent of bamboo grain. The look is subtle, and much more tactile in nature inviting you to run your hands over the surface, but is clearly present and intended to be noticed. This softens the otherwise monolithic look and feel of the shell situated ahead of anyone not seated in a bulkhead row. In front of you is a large, 18-inch, HD, touchscreen monitor. The picture is clear and quite bright. It’s the perfect size for the seat given how close you sit to it, making it both very easy to see and to reach when wishing to manipulate the IFE. 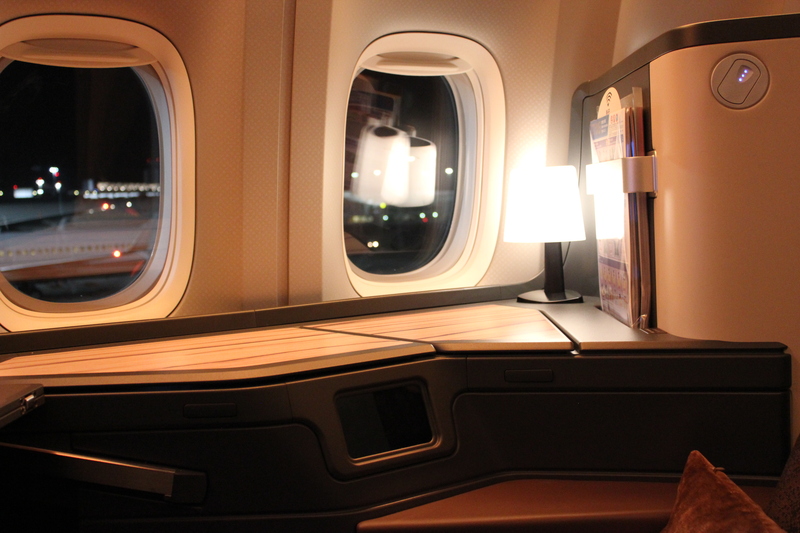 Opposite the screen, at the rear of the pod, is a decorative and functional table lamp great for use when lights are dimmed for takeoff or landing, or to provide for some work lighting while others are sleeping. Plus, we think it’s a decorative and functional addition to the seat that provides a touch of hominess to the overall feel. Hidden amongst the frame of the seat are several storage compartments. The larger houses your China Airlines-branded slippers, on-ear, noise cancelling headphones, the corded IFE controller, two USB ports, and a multinational power outlet. The slippers are amongst the nicest slippers we’ve received in the sky. The headphones dutifully provided adequate sound and clarity, though we’d probably do better to bring our own on future flights. Another, shallower compartment is just behind the larger and would be good for a small iPad, iPod, glasses, and passports. The height-adjustable armrest on the aisle side of the seat sports yet another compartment that holds a welcoming bottle of water and your amenity kit, stocked with Acca Kappa products. Finally, a fourth storage area can be found just forward of the fixed armrest, handy for storing your footwear when you slide into your slippers. In sleep mode, the seat extends to a fully flat, 6’6’’ bed. China Airlines tout the seating surfaces – and thus bed – as being memory foam, but we couldn’t tell and will have to take their word for it. We found the cushioning to be firm but still supportive. 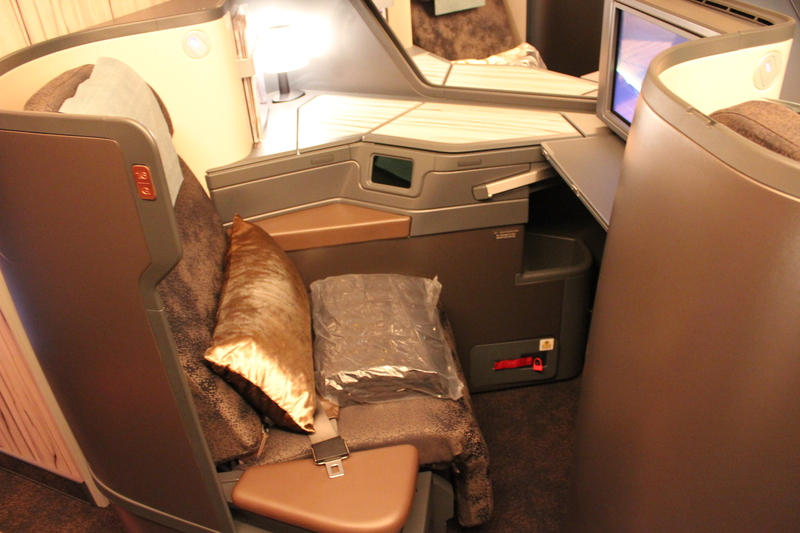 When lounging or sleeping, the seat provided ample give allowing us to settle in comfortably. Shoulder width is adequate for small-to-average passengers, though bulkier fliers may feel a bit pinched for space. Still, back, side, and stomach sleepers should have no problem getting several, uninterrupted hours of sleep, which is the true test of comfort. Pre-departure water, orange juice, and apple juice were offered as soon as we were seated, baggage stowed, and coat hung by the attentive in-flight crew. It’s worth noting that China Airlines did not offer alcohol on the ground, so any orders for cocktails will be held until cruising altitude. Food and drink menus for both late night/early morning flights were handed out pre-departure, as well. 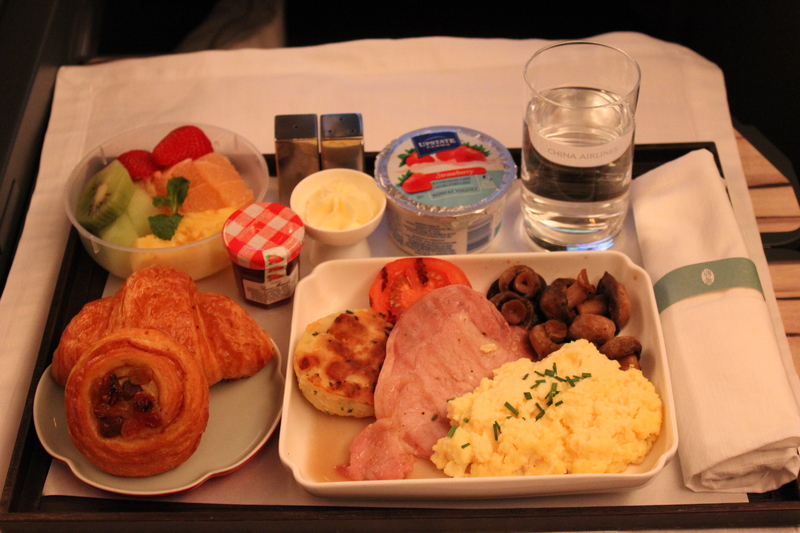 To our disappointment, orders for both the abbreviated supper and the following breakfast were taken shortly before departure and menus quickly collected thereafter leaving passengers with minimal time to make a choice on both meals or to peruse the menu later during the flight to review what was on offer for snacking between meals. While we didn’t ask to see the menus again, we’re sure the crew would have happily obliged had we asked. Still, though, we’d have liked to keep the menus for the duration of the flight and think this is an easy fix for China Airlines. Dinner service began once we’d reached cruising altitude. Given the late departure times for both flights, service was expedited to maximize sleeping time, even on the eastbound flight, which landed in the evening. Hot towels and drinks were served first, followed promptly by the starter, salad, a fruit medley (with some of the freshest fruit we’ve seen on a plane), and soup all served on one tray. To keep the process moving, flight attendants kept a watchful eye on each passenger’s progress ensuring glasses never went empty and that the main course was served as soon after the starters as permissible without being forceful. This continued through to dessert, which wrapped-up most passenger’s meals about an hour-and-a-half into the flight and prepped most to tuck into a movie or their beds for the remainder of the way across the Pacific. For dinner, we tried both the Western and Taiwanese options. 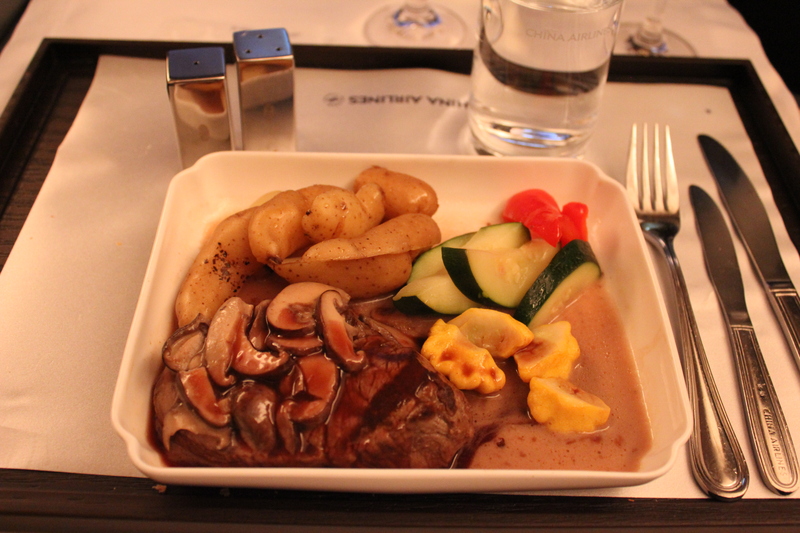 The Western option – a beef fillet – was one of the best pieces of beef we’ve had in the sky. The Eastern option consisted of stir-fried shrimp that was of a quality very similar to dishes we had in numerous restaurants on the ground. Finally, the Western breakfast was an omelet and the typical trimmings; perfectly satisfying for a pre-arrival meal without feeling overstuffed or overly salted. When it was time to turn in for the evening, or morning as it were, China Airlines offer a turndown service that provides a fluffy duvet and a standard-sized pillow in addition to the thick blanket and bolster pillow that awaited us at our seats upon boarding. The flight attendants were more than happy to oblige when asked for the turndown and our seats were made up after a quick trip to the lav. We found the duvet served better as a mattress pad, though, with the thinner blanket as a covering. In all, we slept for a solid 7+ hours, waking just in time for breakfast. 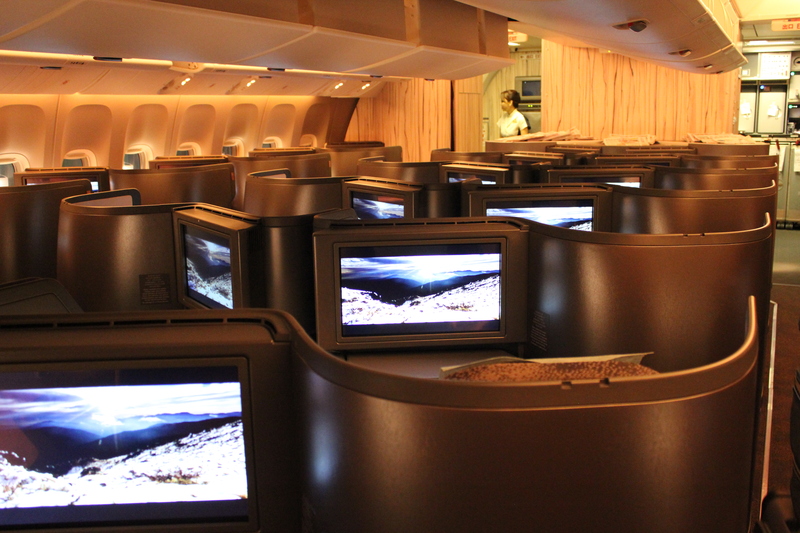 China Airlines have provided not just a large screen for viewing movies, but have provided as well a large selection of recent releases in a variety of languages – English and Chinese being the predominant. Even the not-so-recent releases were full of our favorites and had several genres to please most any traveler. For television, we found a few Western series of moderate popularity and a bounty of Chinese series, with a handful hailing from other Asian origins. We didn’t listen to the playlists available so we can’t comment on the quality, but there was a decent selection to meet most tastes. We found the ex3 system to be generally intuitive, and the touch-screen features were a pleasure to use. Of special note is the ability to scroll through a movie in a process much like the scrubbing feature found on the iPhone and iPad (iOS). 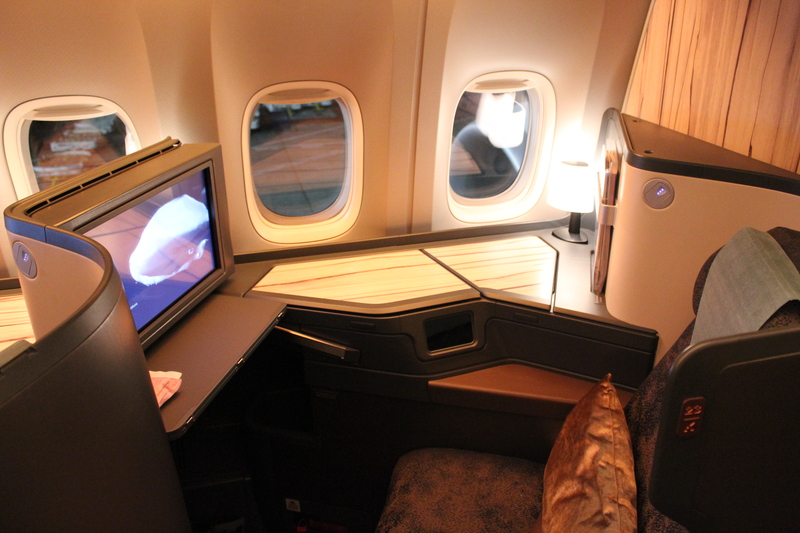 Overall, the system was responsive to both touch-screen and the controller and certainly helped the flight whiz by. We also enjoyed the mapping function, which offered multiple 3D views and angles to track our flight’s progress. Offering onboard Wi-Fi across the Pacific is a recent development for most airlines, and a China Airlines have dived right in. Connections speeds were very decent for in-flight wifi across an ocean, though at US$11.95 for an hour, and only meager quantity discounts for packages of longer duration, we’re not sure we could recommend it unless you absolutely must work overnight or you’re travelling for business and your employer reimburses you. Our flights were superbly enjoyable. 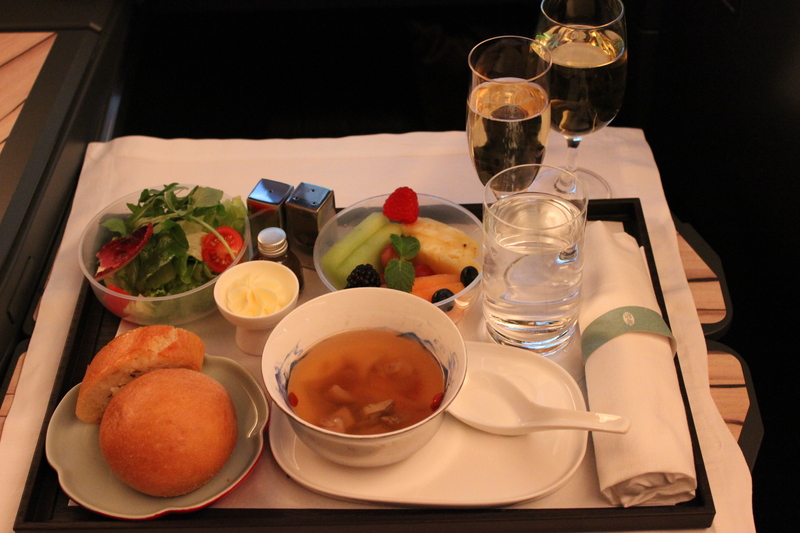 Food, drink, and service were amongst the best we’ve experienced in business classes on most airlines and comparable to first class on some – and certainly hold their own among the majority of other Asian carriers offering similar routes. We were able to sleep at least 7 hours on both flights, arriving at both destinations legitimately refreshed – not to mention well fed – and no worse for wear despite the relatively long flight time and late departures. We’re excited to see this new competition in the market, especially against the US legacy carriers that seem to only recently be taking seriously their long-haul business products. And with a generally competitive price point for return tickets and an expansive intra-Asia network, we wouldn’t hesitate to book with China Airlines or recommend them to others in the future. THEDESIGNAIR.NET TRAVELLED AS GUESTS OF CHINA AIRLINES, HOWEVER THE VIEWS EXPRESSED HERE ARE OUR OWN. The cabin gives a sense of warmth. I wasn’t crazy about the wood panels, but I guess it creates a illusion of not being on a airplane. And I always heard the food on China Airlines is fantastic. Plus, I love their livery. Thanks for the very informative review! China Airlines definitely are an important player in the market, and I cannot wait to try their similar business class service from/to Frankfurt! 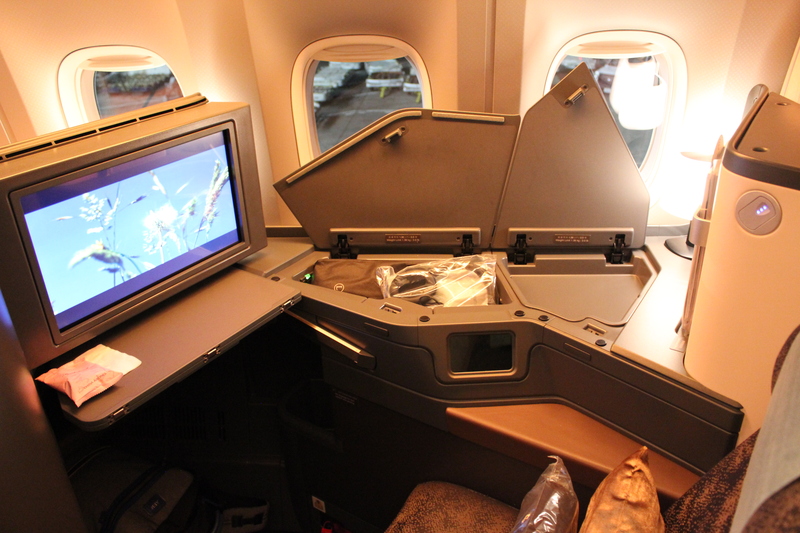 Actually, the covers for the storage compartments can be used as privacy divider between the coupled center seats. the new uniform of China Airline withdraws a lot of negative comments on local media and frequent flyers. Personally I am not a big fan of the new one and prefer the old style. They also use plastic bowl for fruit on the business class which is really an eyesore. Taiwan is Central Asia? Try looking up Central Asia on Wikipedia.